New research shows that some scorpions can tailor their venom depending on the task at hand, whether it be snatching its next meal or protecting itself against predators. It marks the first time that scientists have documented the ability of an animal to adjust the toxicity of its venom according to need. Scorpions need to be able to find and capture food (usually insects), but also deter predators (such as small mammals). Thankfully for these arachnids, venom can perform double-duty for these tasks, but as Jamie Seymour from James Cook University points out, scorpions produce venom that’s specific for predators and another kind that’s specific for prey. And in fact, scorpion venom is, at any given time, a complex mixture of different toxins. Going into the study, Seymour figured that frequent exposure to predators should cause a scorpion to produce greater amounts of the defensive venom compared to offensive venom. To test this theory, he recruited a team of ecologists, chemists, physiologists, and a batch of Australian rainforest scorpions. 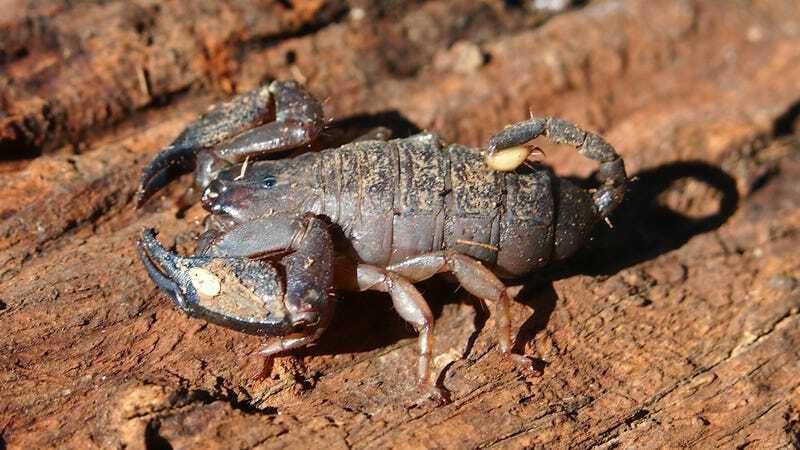 Also known as Hormurus waigiensis, these two-to-three inch long scorpions are well adapted to the rainforests of Queensland and northeastern New South Wales. For the experiment, Seymour’s team subjected these scorpions to one of three conditions: exposure to live crickets (prey), exposure to dead crickets (control), and exposure to a taxidermied mouse (which simulated a predator threat). After six weeks, the scorpions who were exposed to the simulated predator featured a very different venom chemistry than those who weren’t exposed to the taxidermied rodent. “Exposure to a simulated predator appeared to decrease relative production of toxins that would work on insects, while generally increasing the production of a section of the venom profile with activity towards mammalian, e.g. mouse, cells,” said ecologist Tobin Northfield, a co-author of the new study, which now appears in Proceedings of the Royal Society B. This finding doesn’t mean that scorpions can suddenly adjust the chemistry of their venom on the fly. 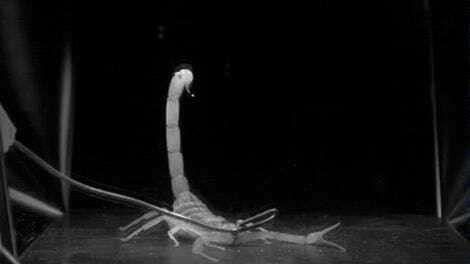 Rather, it means that scorpions who are under constant pressure by predators over a protracted period of time (in this case, six weeks), are capable of adjusting their venom chemistry in response. “Our findings provide, to our knowledge, the first evidence for adaptive plasticity in venom composition,” conclude the researchers in the new study. This is cool because it means that scorpions—or at least the Australian rainforest scorpions—have a built-in toxin regulator that re-routes internal resources to increase or decrease venom production according to need. Looking to the future, scientists will need to detect the same ability in other scorpion species, and study how they do it. In terms of real world applications, these future discoveries could be used improve the efficacy of anti-venoms.